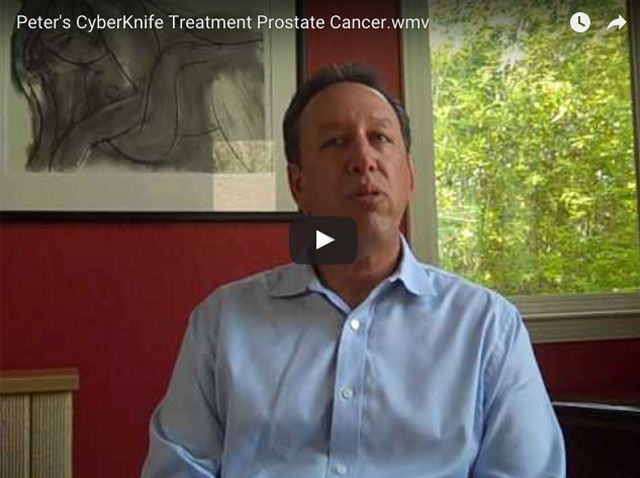 How Does CyberKnife Treat Prostate Cancer? The CyberKnife System is a non-surgical treatment that delivers high doses of radiation directly to the prostate tumor while avoiding surrounding areas using Stereotactic Body Radiation Therapy or SBRT. In fact, the CyberKnife system is so precise (sub-millimeter accuracy) that it can automatically track natural organ movement of the prostate and adjust the treatment accordingly, which allows us to significantly reduce the side effects that accompany radiation therapy. Our nationally-recognized and board-certified physicians deliver individualized treatment with the CyberKnife System. Radiation sessions typically last between 20 and 45 minutes, with most patients requiring four or five treatment sessions. What are the Advantages of the CyberKnife Prostate Treatment? It is all about precision. Delivered by its uniquely designed robotic arm, the CyberKnife System is able to continually track tumor movement throughout each treatment. Because of this, we can protect healthy tissue while ensuring that the prostate tumor receives adequate treatment. One of the major difficulties in traditional cancer treatment is the ability to adjust for involuntary and unpredictable organ and tumor movement inside of the body. Throughout the course of treatment, the prostate gland will adjust its position as much as 5 mm in as little as 30 seconds. These movements occur due to filling of the bladder, gas in the bowel, and patient movement during the procedure. Even a small change can greatly affect radiation delivery. By constantly tracking the prostate gland and malignant tissue, the CyberKnife System will automatically adjust for movement in real-time. There is no need for the therapy to stop and the arm to be adjusted, the robotic arm will take care of the work and deliver accurate radiation therapy for a much more successful treatment. Without the CyberKnife System, traditional treatment has been invasive surgery or broad-spectrum radiation treatment. 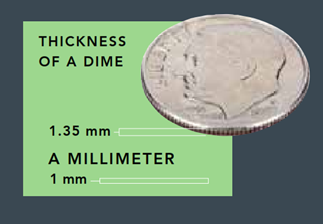 Instead of operating or targeting general regions with large doses of radiation, we are able to use pin-point accuracy within the thickness of a dime. The CyberKnife System is manufactured by Accuray, a company that appears in the Top 10 on Fast Company’s list of most innovative robotic companies. It works by using an image-guided linear accelerator that is mounted onto a robotic arm. The accelerator transmits stereotactic radiation from hundreds of different angles to ensure maximum effect on the malignant tissue. The robotic arm is not fixed in any one position, but rather it is able to move around and adjust to any angle that is needed. With this range of motion, the CyberKnife System is able to avoid healthy tissue and conform its transmitted radiation to the exact shape of the patient’s prostate tumor. Consultation with one of our board-certified Radiation Oncologists to determine the best treatment plan and option for you. The physician will review the patient’s PSA, gleason score, biopsy results, imaging, and other medical conditions. Pre-Treatment follows the consultation, assuming the patient and doctor agree that CyberKnife treatment is the best option. Before treatment begins, gold pellets (fiducials) will generally be implanted into the prostate, with stainless steel pellets being used if the patient is allergic to gold. These fiducials allow the tumor to be tracked during SBRT treatment. Three to four fiducials will be implanted two weeks before treatment sessions begin. Imaging & Dose Planning occurs about a week after the fiducials have been implanted. This allows the physicians to plan the patient’s individualized SBRT treatment plan. Treatment will start approximately a week after imaging and dose planning happens. Treatment generally consists of four or five sessions of short duration radiation that takes place over the course of one to two weeks. Radiation treatment consists of the patient lying on one of our treatment tables while the CyberKnife System implements the specified dosage and targeting needed to most successfully treat the patient’s prostate tumor. No anesthesia is required for during radiation treatments. How is it Determined if I am a Candidate for CyberKnife Treatment? Following diagnosis, each patient will receive a personal consultation with one of our board-certified radiation oncologists. One of the considerations in deciding candidacy is a patient’s prostate cancer classification or “risk” profile. Stereotactic Body Radiation Therapy or SBRT, such as is used by the CyberKnife System, is recognized by the American Society of Radiation Oncology (ASTRO) as an appropriate and effective treatment option for all but high-risk prostate cancer patients. For high-risk patients, CyberKnife treatment may still be used, but in conjunction with other treatments. How Effective is the CyberKnife System in Treating Prostate Cancer? Since 2002, peer-reviewed journals have published over twenty articles about studies involving the CyberKnife Radiosurgery System and its treatment of prostate cancer. The largest study took place in 2013 and involved 1,100 patients throughout eight medical centers. This study showed that 93% of patients who were treated by the CyberKnife System did not have a prostate cancer relapse in the five years following their treatment. Another study that also took place in 2013, looking at 304 patients who had undergone CyberKnife Treatment for prostate cancer, showed similar results at the six year mark. 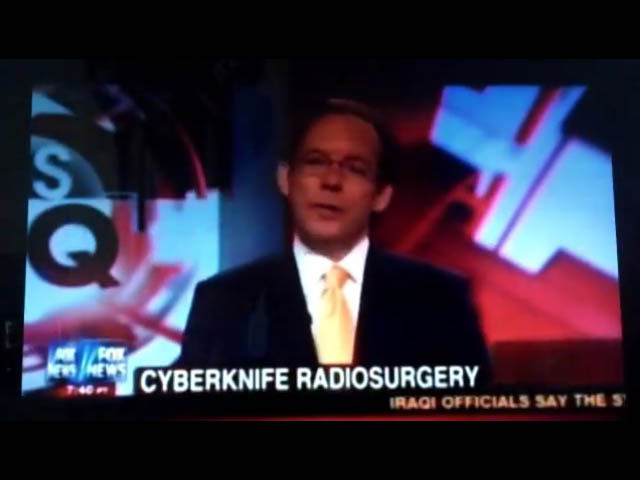 What if I am not a Candidate for CyberKnife Treatment? Not every patient is a candidate for prostate cancer treatment using the CyberKnife System. In this case, it is best to talk to your physician about the best options for your particular diagnosis. 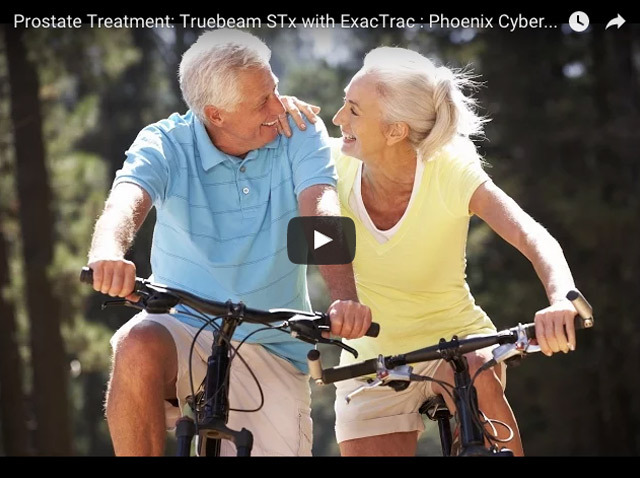 In the event that whole-bed pelvic radiation is determined for disease outside the prostate gland, we also offer TrueBeam STx and TomoTherapy treatment options at Phoenix CyberKnife Center. These treatments utilize a CT-based delivery system that replicates its CT-imaging for highly tumor-conformal dose delivery. 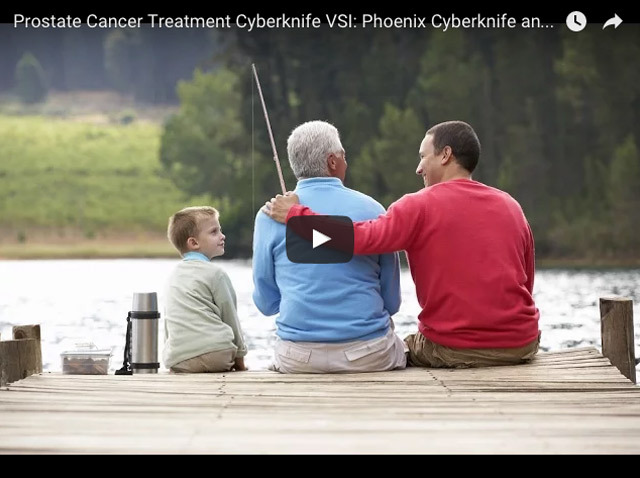 What are the Side Effects to CyberKnife Prostate Cancer Treatment? 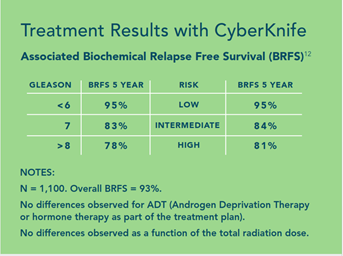 CyberKnife SBRT utilizes a higher dose rate than traditional radiation, however, according to an 864-patient study published in 2013, it was shown that SBRT side effects are no worse than side effects experienced with traditional radiation. The study found that “a transient and modest decline in urinary and bowel QOL [Quality of Life] during the first few months …[that] quickly recovers to baseline levels.” In fact, most patients resume normal activity immediately after treatment sessions. With that being said, possible complications that accompany any radiation therapy treatment are: urinary incontinence, bowel issues, and erectile dysfunction. Is CyberKnife SBRT Covered by Insurance or Medicare? SBRT treatment for prostate cancer is nationally covered by Medicare and many private and health exchange insurers. Before treatment, make sure to contact our center and our authorization team will review your insurance and the exact coverage benefits. For patients who live outside the United States, please request relevant information from us, and we will work with you to determine insurance coverage. Radiation therapy uses photons (high-energy x-rays) to ablate, shrink, or control the growth of tumors. It works by damaging malignant cells and tissue, which causes them to discontinue growth. The goal of radiation therapy is to destroy cancer cells while retaining healthy cells. Traditionally, broad-spectrum radiation was used to treat cancer, but with technological advancements, we can address cancer treatment in a much more focused way. Radiation is often used in conjunction with other therapies, and for some it can be an alternative to surgery depending on your specific diagnosis. The CyberKnife System used at Phoenix CyberKnife uses SBRT, an advanced form of radiation therapy. Stereotactic Body Radiation Therapy or SBRT is a treatment that uses high-doses of radiation with sub-millimeter accuracy. By doing this we can ensure that the tumor is correctly targeted while minimizing healthy tissue exposure. Studies show that prostate cells are very sensitive to the amount of radiation delivered in each treatment session. Because of this, a higher dosage over fewer sessions is generally best practice in treating prostate cancer, making SBRT the optimal method of radiation therapy available. Compared to other radiation therapy options, which normally require 35-45 sessions over six to nine weeks, SBRT can be completed in four or five sessions over one to two weeks. By reducing the treatment time frame, it also reduces the disruption radiation therapy has on a patient’s daily routine. The American Cancer Society estimated that 220,800 men would be diagnosed with prostate cancer in 2015. Of those men, 27,540 would die from the disease. Prostate cancer is the 2nd leading cause of death among men with cancer. Age: about 2/3 of men with prostate cancer are 65+. Race: prostate cancer is more common in African American and Jamaican men of African heritage than in white men. Family History: men with immediate family members who have had prostate cancer are more likely to get prostate cancer themselves. According to the American Cancer Society, men 50+ should be screened for prostate cancer using a digital rectal exam (DRE) and a blood test to check their prostate specific antigen (PSA) level. 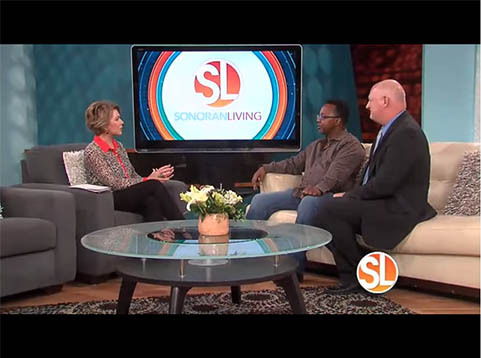 African American men or those with a family history of prostate cancer should be examined at the age of 45. The best way to detect prostate cancer early is to be screened during your yearly physician starting at age 50 (45 for African American men or those with family history of prostate cancer). Many patients with early prostate cancer do not have any symptoms. Cancer starts at a cellular level as a microscopic change in the prostate gland called prostatic intraepithelial neoplasia or PIN. Almost half of all men have this change occur by age 50. If a PIN is discovered, it does not mean that the patient has prostate cancer, but you will want to closely monitor the situation with your physician to avoid a PIN becoming prostate cancer. When doctors notice high-grade PINs, there is a higher chance of prostate cancer developing. The most common type of prostate cancer is adenocarcinoma. Less common types of prostate cancer include carcinoid and small-cell cancer. Adenocarcinomas develop very slowly inside gland cells. 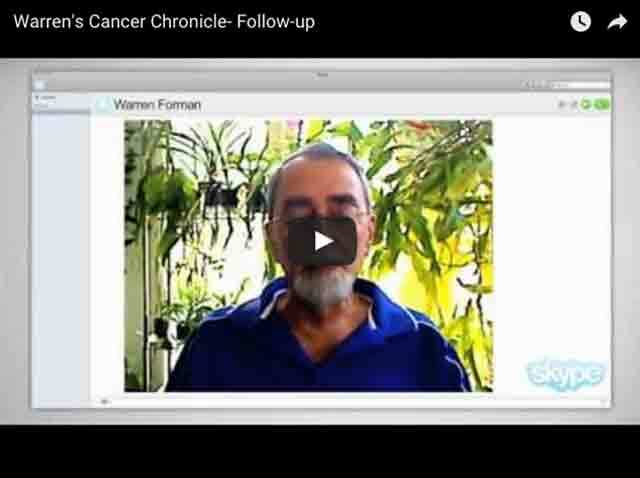 This is why most physicians take a “watch and wait” approach to prostate cancer diagnosis and treatment. If an adenocarcinoma spreads to other parts of the prostate, or other parts of the body, more aggressive treatment is then needed. The medical community is not entirely sure what causes prostate cancer, but our understanding of the disease has expanded in recent years. Most cases of prostate cancer occur due to a DNA mutation, which causes cells to grow abnormally. This mutation seems to come with age after the prostate gland cells have had ample time to continually divide. While doctors aren’t entirely sure what can cause prostate cancer, they do know that high-grade PINs have between a 20 and 30 percent chance of becoming cancerous. Because of this, regular PSA screening and rectal examinations are suggested, as well as a prostate biopsy, if necessary. Yes, prostate cancer can be cured when it is detected and treated early. Because of routine screenings, more than 90% of prostate cancer cases are discovered early enough for treatment. Of these cases, many of them are likely to respond to treatment. Keep in mind that “curable” relates to how long a patient remains cancer-free following treatment. The more patients who remain cancer-free for five years or longer, the higher the curability is of a particular disease. Prostate cancer has one of the highest curability rates of all forms of cancer, thanks in large part to early detection from routine screenings. When prostate cancer is detected early and hasn’t spread outside of the prostate gland, the five-year survival rate is nearly 100 percent. 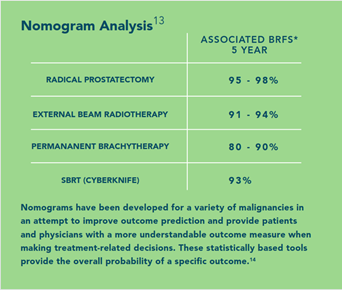 What are Advantages to SBRT?